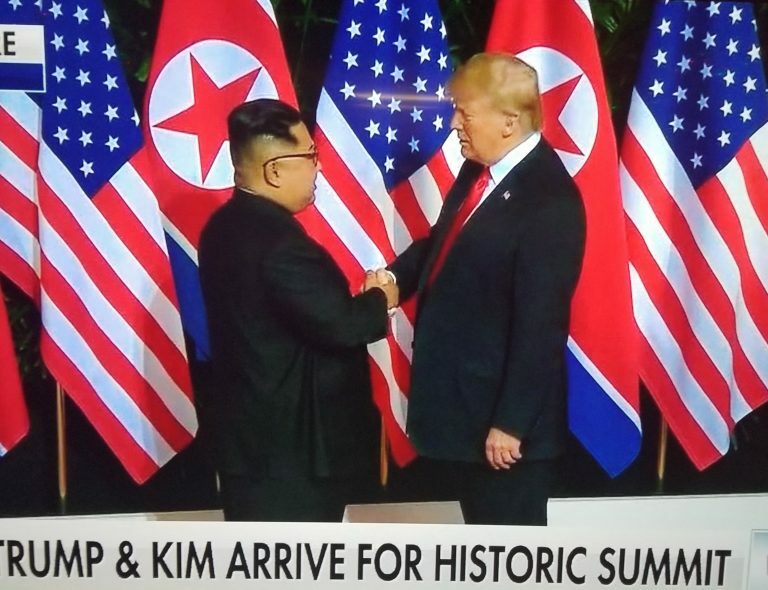 Just six months after trading threats about their respective “nuclear buttons,” President Trump and North Korean leader Kim Jong-un met in Singapore this morning. The meeting was held in Capella resort, an isolated hotel on Sentosa Island in Singapore. The two leaders kicked things off by meeting with only their translators present, a U.S. official said. Trump and Kim and their translators met first in a session first, before allowing their respective advisers to join them. President Trump’s advisers who were at the meeting are his Secretary of State, Mike Pompeo, his Chief of Staff, John Kelly and Ambassador John Bolton, his National Security adviser. After meeting with Kim privately for about half an hour, Trump declared that they have an “excellent relationship.” Trump predicted that he and Kim will have a “terrific relationship,” and said it’s his “honor” to sit down with the North Korean dictator.